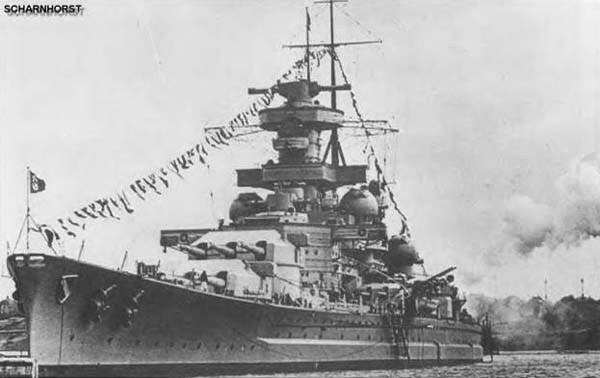 There were two battleships in this class built for the German Navy, the other being Gneisenau. Sharnhorst’s first deployment during World War Two was to patrol the Faeroes/Iceland passage. This led to her sinking the British merchant cruiser Rawalpindi. Her next role in the war was to provide support for the German invasion of Norway. During a battle in the Norwegian Sea June 8th 1940, Sharnhorst and Gneisenau sank the British carrier Glorious and the destroyers Acasta and Ardent. Between January 22nd and March 22nd 1941, Sharnhorst and Gneisenau were operated in the Atlantic sinking several Allied merchant ships before putting into the German held port of Brest/France. 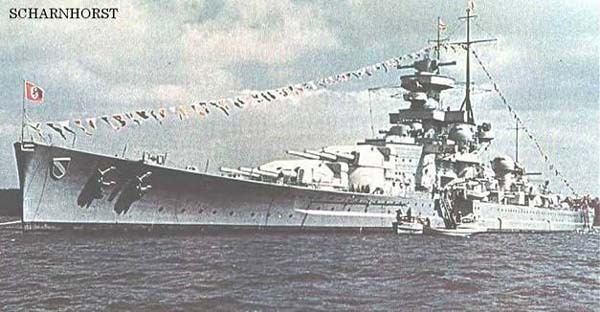 With British bombers making frequent attacks on the German warships based at Brest, Sharnhorst, Gneisenau and the heavy cruiser Prinz Eugen were forced to make a desperate run through the English Channel to safer ports in Germany February 11th 1942. After repairs to damage sustained by hitting a mine on that voyage, Sharnhorst was deployed to Northern Norway for attacks on supply convoys bound for Russia. On December 26th 1943, Sharnhorst along with a few destroyers attacked one of these convoys. The convoys escorting British cruisers Belfast, Norfolk and Sheffield engaged Sharnhorst in a battle until the battleship Duke of York along with supporting cruisers and destroyers arrived at the scene. That three hour-long battle ended with Sharnhorst devastated by gunfire and sunk by torpedoes. There were only 36 survivors from her crew of 1,968. Gneisenau also hit a mine after fleeing Brest and later sustained serious damaged by Allied bombers while being repaired at Kiel. Her damaged hulk was used to form a blockade at the mouth of Gdnyia Harbor in March 1945.